Enter outer space from the comfort of your own home. International Space Station Tour VR is now available on Windows Mixed Reality, Steam, Oculus Rift, Google Cardboard, Google Daydream & Viveport! Put on your space suit and gear up for an amazing experience that will allow you to see Earth from 400km above the surface. International Space Station Tour VR is now available for FREE on Windows Mixed Reality, Steam, Oculus Rift, Google Cardboard, Google Daydream and Viveport. WATCH THE INTERNATIONAL SPACE STATION TOUR VR LAUNCH TRAILER HERE. Download International Space Station Tour VR from Steam (https://tinyurl.com/y9f74v5g), Oculus Store (https://www.oculus.com/experiences/section/rift/1834223926601207/ ), Windows store (https://tinyurl.com/ycsuuh2w), Google Play (https://tinyurl.com/yac9hq94) and Viveport (https://tinyurl.com/yb3l8oum) for free and experience what it’s like to be an ISS crewmember. You can also enjoy the app on Windows Mixed Reality (https://www.microsoft.com/store/apps/9P49RQXTSQ1K ), where the app was first released. Thanks to incredible 360º technology, combined with high-quality photos taken by the European Space Agency and videos recorded by Italian astronaut Samantha Cristoforetti, The House of Fables studio was able to create this one-of-a-kind, immersive experience of actually visiting the International Space Station and learning about all the research done on board. We first released ISS Tour VR on Windows Mixed Reality and are proud to now introduce it to new platforms. Making the app available on HTC Vive, Oculus, Google Cardboard, Google Daydream, Viveport, and doing so completely for free, means that more people will get the chance to visit places they’d never be able to visit otherwise, and experience things that normally only a few of us can experience, like visiting the ISS – Adam Robaszyński-Janiec, CEO of The House of Fables. 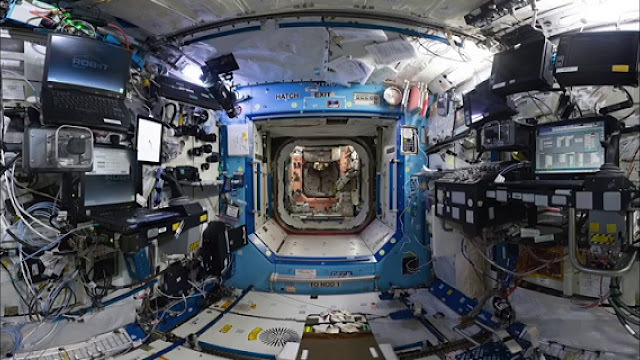 Space enthusiasts will get the chance to visit all eight modules of the station (American, European, Japanese and Russian) thanks to the International Space Station Tour VR. They will also be able to learn more about its facilities by watching movies, interacting with the equipment and reading about how it all works. More information about the app and other titles by The House of Fables can be found on the official website: http://www.thehouseoffables.com and Facebook: https://www.facebook.com/TheHouseofFables/ .